» Architects Hawaii's 17th annual Halloween Pumpkin Carving Competition runs 8 a.m. to 4 p.m. in the American Savings Bank Tower lobby. Vote for your favorite through noon. » The University of Hawaii School of Architecture's competition runs 6 to 10 p.m. at the school, 2410 Campus Road. The event includes a costume contest. All the pumpkins will enjoy afterlives as donations to children's organizations or local hospitals. Momoyama Restaurant in the Sheraton Princess Kaiulani Hotel celebrates its 35th anniversary with a "Hauoli Tanjobi" Celebration, 6 to 9 p.m. Friday. Chef Mitsuru Yamada has planned a menu of sashimi, sushi, poke, tempura and Momoyama's chicken karaage. More than 20 types of sake and several wines and beers also will be served. A toast with Kubota-Manjyu sake will open the celebration. Cost is $55 in advance and $65 at the door, with a portion of the proceeds to benefit the Junior Chamber of Commerce. Call 921-4600. 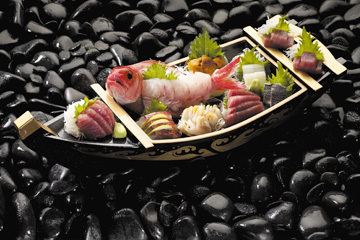 Sushi selections will be offered at Momoyama. Kapono's at Aloha Tower hosts the Hawaii Maritime Center's Third Annual Fish Fry, 6 to 8 p.m. Friday. The event benefits the center's educational programs. Entertainment will be by slack-key guitarists George Kuo and Martin Pahinui, singing songs of the sea, and Henry Kapono. The food will be by Chai's Island Bistro, Gordon Biersch and Kapono's. Cost is $100, with corporate tables available at $1,000 and up. Call 536-6373. Dixie Grill brings its Crabfest back Tuesday through Nov. 15. The menu includes Crab-Stuffed Shrimp, Fried Green Tomatoes with Blue Crab Creole Sauce, Dungeness Crab Cobb Salad, Soft Shell Crab Po' Boy, Dixie Done Deviled Crab Rolls and Pan-Roasted Dungeness Crab. Also: King Crab Platter and the Trash Can O' Crabs. Daily specials: Carolina K Sar-Dee-Ya and Caesar Salad on Mondays; Deep-Fried Shrimp and Soft Shell Crab Combo on Wednesdays; Beer Batter Crab Cakes on Thursdays, Soft Shell Crab n' Shrimp Etouffee on Fridays, Steak and Snow Crab Combo on Saturdays and Crab-Stuffed N'awlins BBQ Salmon on Sundays. Call 596-8359 (Ward Avenue) or 485-CRAB (Aiea). Azul Restaurant at the Ihilani Resort and Spa introduces a Sunday champagne brunch today. Chef Randal Ishizu's buffet menu includes smoked salmon and scallops, Lobster Benedict, prime rib and Porcini-Dusted Lamb Chops. Traditional breakfast specialties are given a twist -- Mango-Stuffed French Toast, for example, and French Brioche filled with scrambled eggs, caviar and smoked salmon. A raw bar and chocolate fountain are included, along with Charles Heidsieck champagne. Brunch is served from 9 a.m. to 2 p.m. Cost is $45, $40 without champagne. Children are $24. Call 679-0079. The Hanohano Room's monthly WineView seminar celebrates "Thanksgiving Down Under with the Wines of Kirralaa," 6:30 p.m. Thursday. Alan Suzuki of Robert Mondavi hosts the tasting, featuring six wines of different grape varietals served with Thanksgiving pupus. Cost is $30. A five-course, wine pairing dinner shadows the tasting on Nov. 17, priced at $80. Call 921-4600. The Hanohano Room is in the Sheraton Waikiki Hotel.